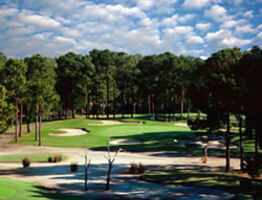 The Sea Trail Golf Plantation is one of the most refined courses along the Grand Strand featuring several courses designed by some of the finest architectural designers. The Byrd Course, for example, designed by Willard Byrd is a unique and unforgettable course created around stunning mad-made lakes and softly undulating greens. Deceptively placed sand bunkers present a unique challenge that demands both strategy and focus. However, dedication to the course is adequately rewarded at the Jones-Byrd clubhouse with a refreshing drink. Whether golfers are looking to play for the day, the weekend, the week, or even the month, Sea Trail Golf Plantation provides only the most optimal services and amenities so that guests feel warmly welcomed at all times. Two clubhouses provide an abundance of relaxation. Golfers can rest up after their all their hard work in the lounge areas, at the snack bar, or in the restaurant where they will enjoy a delicious full-course meal. Introduced in the Fall of 1990, The Byrd Course extracts the best in gameplay and adequacy. Noted for its memorable scenic surrounds and distinctively different approaches to every hole on this par-72 course, golfers have no problem coming back season after season. The course boasts a considerable distance of 6,750 yards from the blues, 6,251 from the whites, 5,561 from the golds, and 4,697 from the reds in order to accommodate players of all skill levels. The course provides a lenient atmosphere and visitors can take small sized coolers out onto the course with them so a refreshing drink is always on hand. Breakfast was cold and theighting at night is very poor. Excited place to have wedding .???????? The Byrd Course, for example, designed by Willard Byrd is a unique and unforgettable course created around stunning mad-made lakes and softly undulating greens.